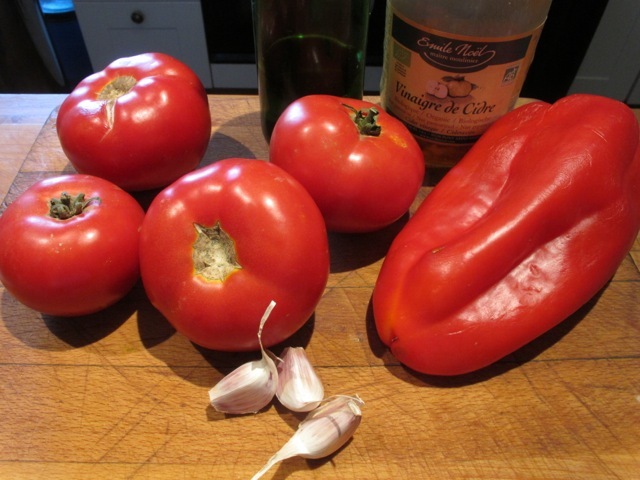 « A bold vinaigrette..with hint of Piaf! Thank you! I’ll let you know how it goes. that looks so refreshing! I may have to try that this year. Gazpacho! Thats what I need!…Thanks for the suggestion! MMMMMMMM!!! I’ll be making this very soon; Maybe tomorrow. Been cooking this often during our lovely hot spell: ideal. When I was in Valencia, we used to eat a lot of gazpacho. Very refreshing on hot days. Do you think tarragon vinegar would be a satisfactory substitute? It would inform the taste with tarragon of course. Might be nice–worth trying to see if you like it. 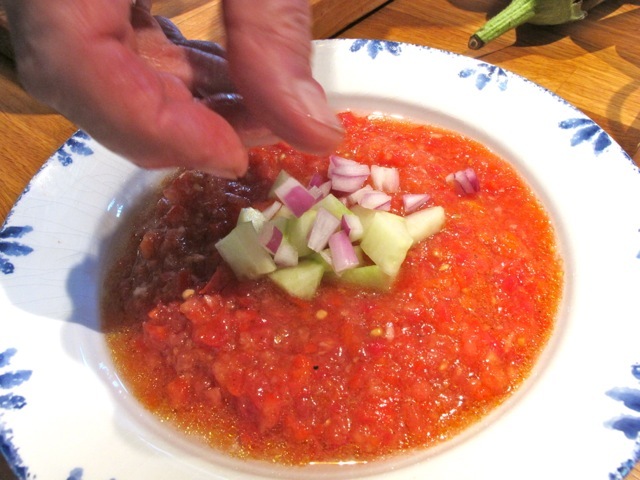 I’ve made your wonderful gazpacho the last couple of summers. It’s great on a hot day! Over the years I have tasted and tried many versions of this refreshing andalucian soup…but this simple one is surely the best, and the most authentic. I think because the onions and cucumber are added as a ‘topper’ instead of being mixed in with the ingredients. It gives a different taste and crunch, (both senses of touch and taste satisfied!) It also tastes even better if you can wait 24 hours or longer, leaving it to marinate in the fridge. 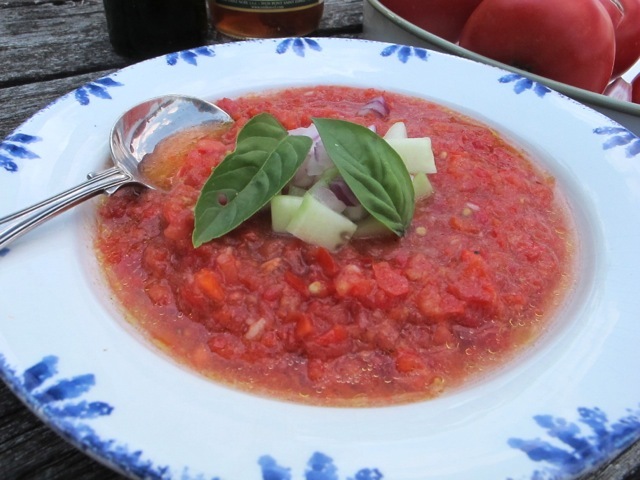 Thank you Robin…such a wonderful effortless recipe when tomatoes are at their best.. Wonderful. Made it yesterday and my friends all had seconds. Found this after hearing you on Radio 4 last week. Thanks Nick and welcome–glad it worked! Many thanks for this wonderful recipe Robin. I tried it this week and it was just divine. I sprinkled a little bit of mint over it the second day to vary it a little and it was great with mint too. It’s unfair to comment about the gazpacho subject, but I can’t seem to find another way to comment about Robin’s quinoa salad, so here goes: I’ve now made countless batches, including one just this a.m. for lunch. (Yum!) On Saturday I took a batch to friends for a pre-opera supper with grilled salmon. They loved it! Asked for the recipe, which I happily supplied. So you see, your recipes are being eaten and enjoyed far and wide, and by more people here in Santa Fe, NM. Btw, I enjoy it with caprese, Cambazola cheese and a little Lillet. A perfect meal. Thanks so much, Robin.